Kymberly loves to dive into many hobbies: productive gardening, crafting, sewing, reading, & everything Japanese. She also loves blue hair! 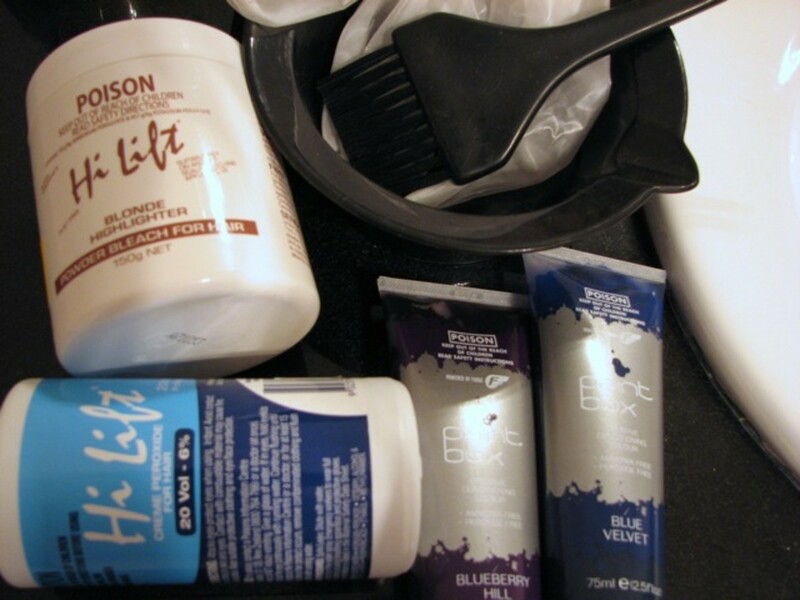 I went blue-haired for the first time in 2004 using the Fudge Paintbox line of temporary hair colors. Unfortunately, although I was aiming for a deep navy blue/purple, I ended up with more of an aquamarine color, which washed out within a month. I wasn't happy, but wasn't ready to give up. I switched colors, combined tubes, tested various shampoos and conditioners, and refined the coloring process until I had a long lasting dark purple/blue, which faded gradually over 3 months into interesting stripes of color. Before following these instructions, make sure you test your skin for bad reactions to both the bleach solution. Also, do a skin test for at least 24 hours to each color that you want to use, individually, and mixed together. How much dye will I need? I needed to use two full tubes of Fudge Paintbox color for my hair when it was a little past shoulder length. Now that my hair is quickly approaching my waist, I would need at least 3, if not 4 tubes. For short hair, I used just under one total tube of color. 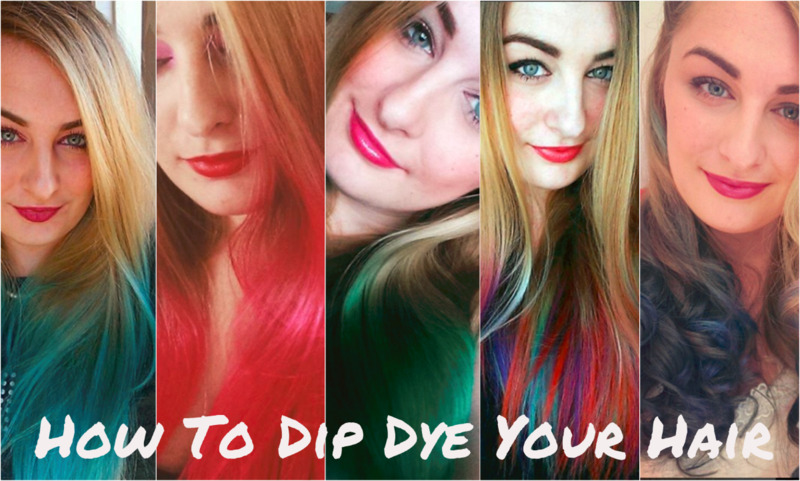 Buy a little more than you think you will need - it's better than running out without completely dying your hair! 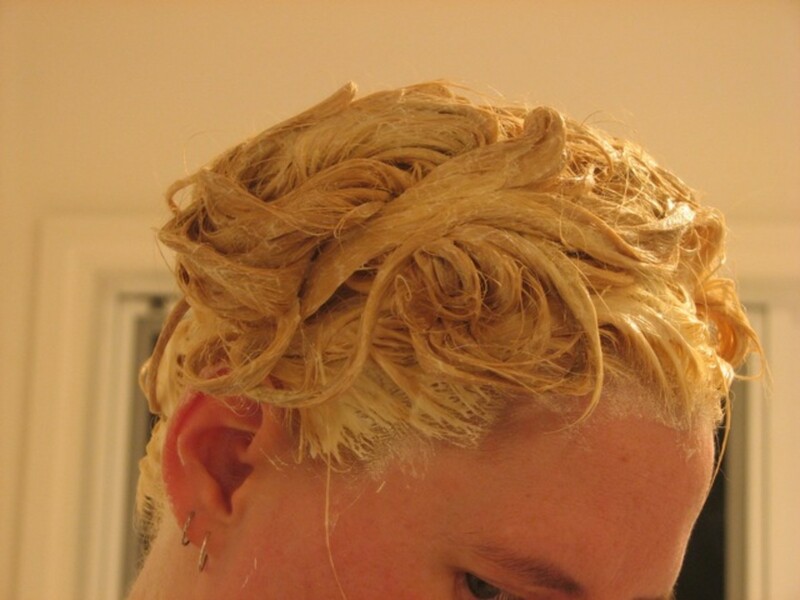 The two things you must have for this process are the bowl (for mixing the bleach, and then the dye), and a wide applicator brush. The comb with the thin tail is fantastic for sectioning hair, and the clips necessary if you have long hair! A great set for a fantastic price! Make sure your hair is clean and dry before starting. 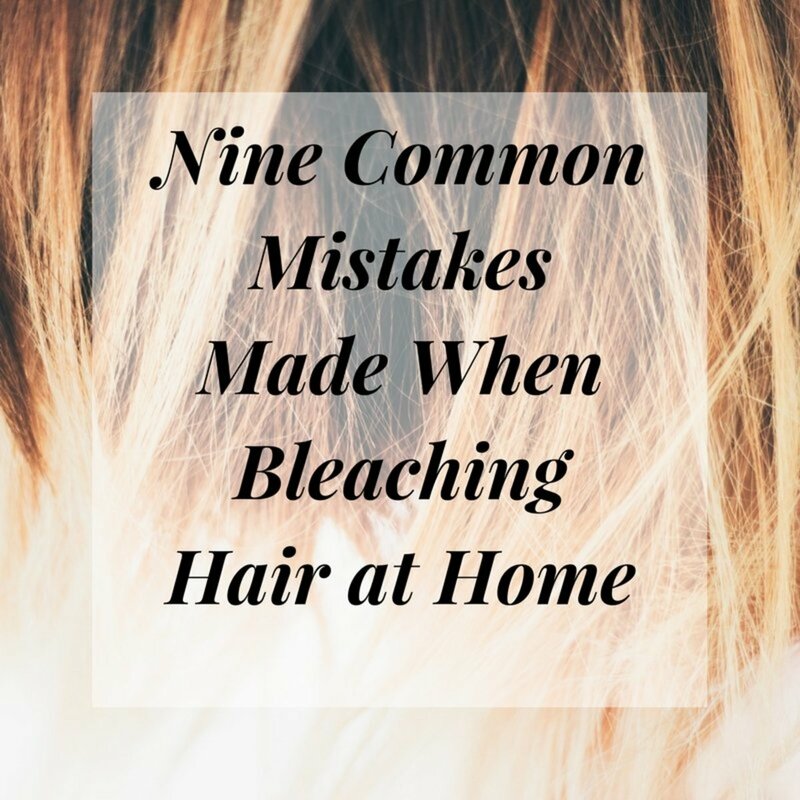 Clear away anything unnecessary - avoid unintended splatter stains of bleach and hair dye! Block access to the bathroom - don't let pets or children inside during this process! 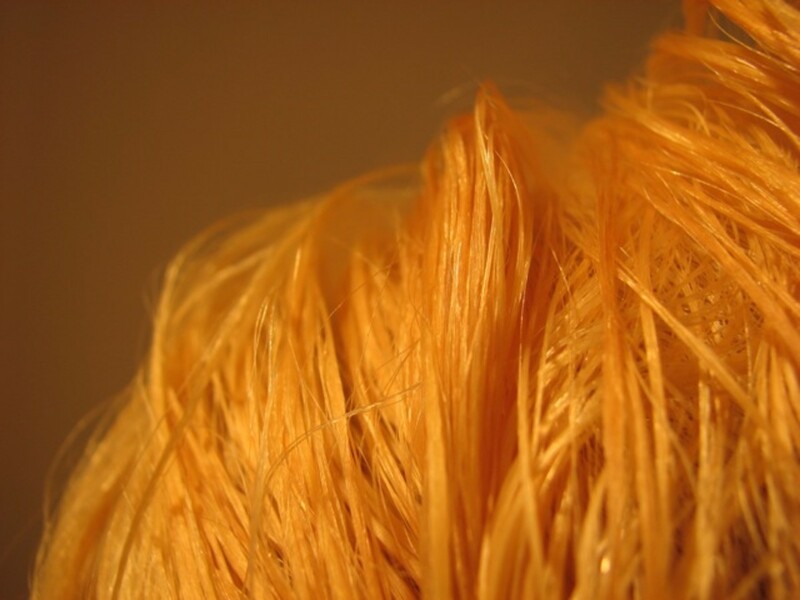 Bleaching allows the hair color to deeply penetrate the hair shaft. Without bleaching, the hair shaft will only allow in a small amount of color, which is easily washed away. I recommend that you bleach your hair, even when you are re-coloring. 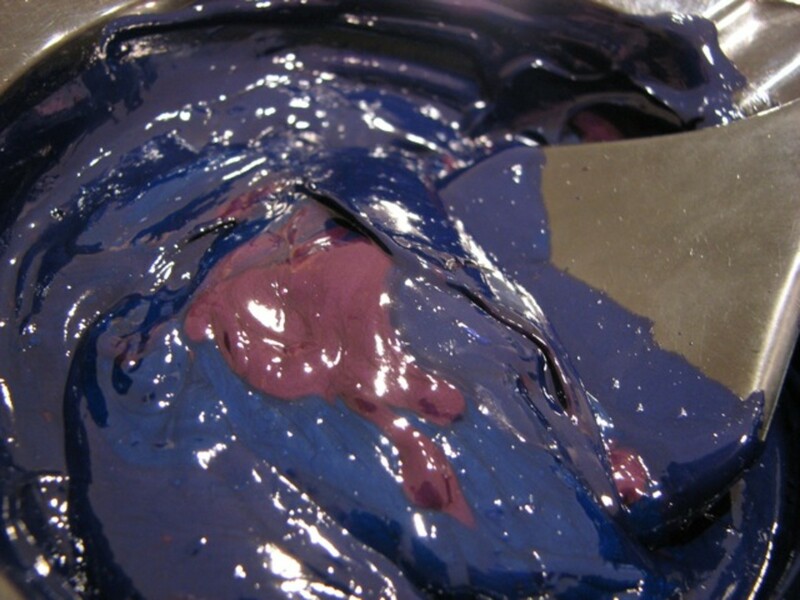 It allows for an even and deep color penetration. I used a 6% creme peroxide developer (20 Volume) with powder bleach, mixed to the instructions on the back of the tubs. I have light brown/dark blonde hair, and with this solution, my hair did not go white (a golden yellow blonde - not the nicest of colors). 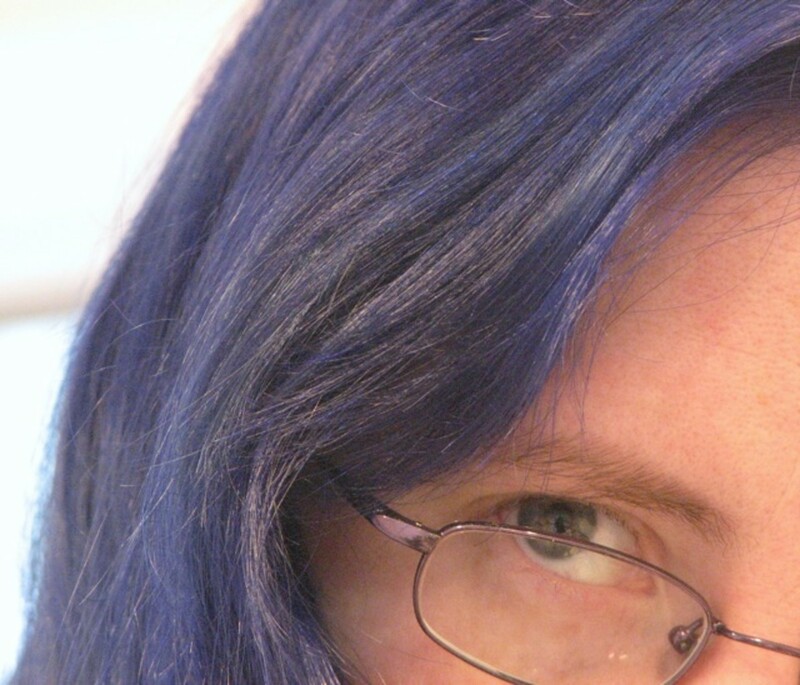 But it did allow for an even dark blue color to cover my hair. Put the old towels on the floor of the bathroom, and wear your old clothes. Open a window and turn the exhaust fan on, if you have one. Bleaching produces a lot of fumes. Protect your hands with plastic gloves. Carefully mix the recommended amount of powder bleach for hair and creme peroxide for hair together in the bowl with the applicator brush. Mix until it becomes a smooth, thick paste. Apply the paste gradually and evenly with the applicator brush, starting from the roots of your hair, at your scalp. Note: If you apply the paste to the ends first, they will knot together, and you will be unable to reach the hair roots! When finished, pile long hair on top of scalp. Don't let it sit on your neck/shoulders! Leave the bleach paste on for the recommended time - specified in the instructions for the bleach powder/creme peroxide. You may experience some burning and itching at the scalp. If it becomes painful, wash the bleach out immediately. While waiting for the bleach to lighten, clean everything thoroughly. Keep wearing the plastic gloves, and follow the instructions for rinsing the bleach out. I find it easier to thoroughly rinse my hair in the shower, rather than bending over a laundry sink. Results: Now your hair should be a lighter, even color. Mine was quite yellow-blonde - very strange! This is where I depart from the recommended instructions on the Fudge Paintbox tubes. Important: You should test to make sure you won't react to the dye over a long time (leave it on your skin for at least a day before washing it off). Keep the towels on the floor, keep wearing your old clothes, the window open, and pets/kids locked out of the bathroom. The last thing I'd want is blue/purple paw-prints throughout the house! 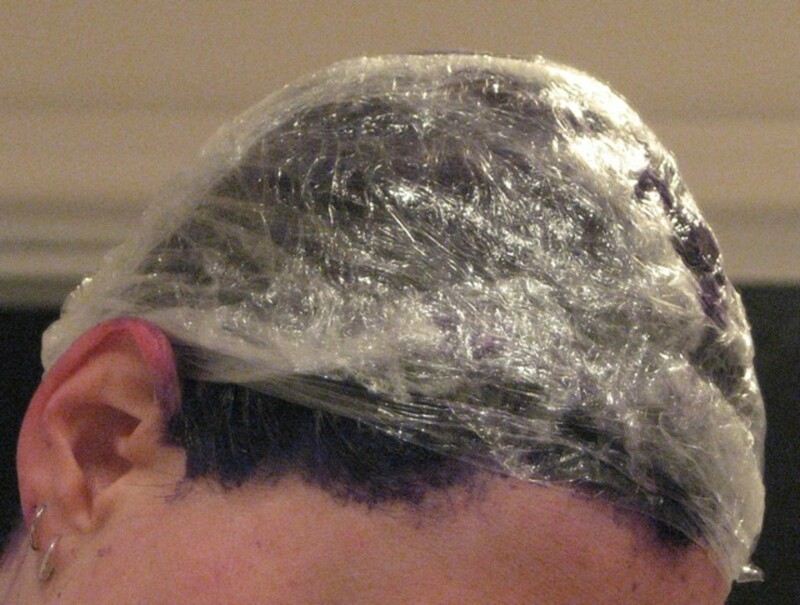 Prepare the plastic wrap - you'll need it when you finish applying the dye. Smear Vaseline (petroleum jelly) around the edges of your hairline, and all over your ears, taking care not to get any in your hair. Skin will be dyed along with hair! Wear plastic gloves to protect your hands. Mix the colors together thoroughly in the plastic bowl with the application brush. You may find it useful to section your hair with small butterfly clips, so you can apply the dye evenly. Evenly 'paint' the dye onto sections of the hair with the applicator brush, starting from the roots at the nape of the neck, moving slowly to cover the whole hair. Tip: I found that an application pattern starting at the nape of the neck and roots of the hair, moving to the top of the head/face and then to the ends of the hair strands minimizes mess, and has the best chance of even application. When your hair is thoroughly coated, massage the 'paint' thoroughly through the hair. It ensures that there is an even coat, from the scalp to the ends. Pile your hair on top of your head, trying to make it as solid and non-slipping as possible. Remove your gloves, and wrap long pieces of the plastic wrap around your hair, until it is solid and covered. Clean the dye from your skin (especially around your ears) using soap and water, and the old face cloth. Don't forget your neck and shoulders, and your hands/arms above the gloves. Also clean any dye splatters that have touched porcelain immediately - they can stain very quickly! Put the plastic shower cap on - it helps keep the plastic wrap in place. Clean everything thoroughly. Dispose of paint tubes and plastic gloves securely. 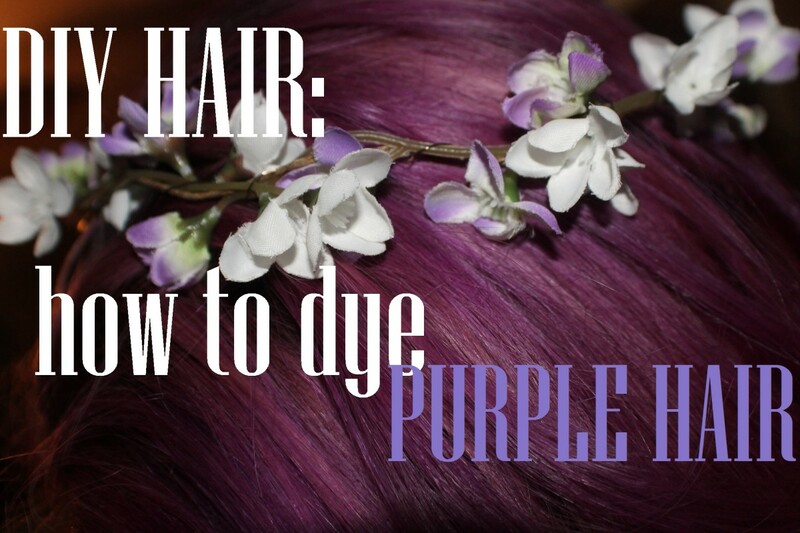 The recommended time to leave the dye on is under an hour. I found that the resulting color was washed out within a month. The best result for me, was when I left the dye in overnight - the heat from my plastic-wrapped head while I slept allowed the dye to penetrate very deeply, resulting in long-lasting color. Disclaimer: I take no responsibility for any adverse reactions - you must test the safety of this on yourself before choosing not to follow the directions for Fudge Paintbox dyes. Use old sheets and blankets. Use old towels and cover your pillow with multiple layers. Protect your doona cover and blankets by wrapping a large old towel over the edge closest to your pillow. The next morning, remove the shower cap and plastic wrap from your hair. Wash the color out in the shower with a lot of of water, while wearing plastic gloves. Shampoo once or twice, and scrub with soap on an old face cloth at any dye patches on the skin to lighten them. Use a large amount of color-care conditioner - this helps to 'set' the color and close the hair shaft. Dispose of the plastic wrap, shower cap and plastic gloves so that kids and pets can't get to them. Wash all towels and clothing that you have used during this bleach/dye process. For the first week, it is a good idea to sleep on pillow covers or a towel that you don't mind dying blue/purple. Color will come from your scalp and hair while you sleep. Paint your nails a dark color - scratching your head will result in dark blue/purple nails! Use old towels when drying your hair after washing for the first few weeks, or until the color stops noticeably dying the towels. Use a top quality color-care shampoo and conditioner, and wash hair every few days, not every day. I trialled at least 5 brands before settling on Loreal's Elvive Color Protect line - it kept the color dark for the longest time of all the brands I tried. With twice-weekly washes, the color gradually faded over 3 months, before I re-colored. Your hair's condition will deteriorate with each subsequent bleach. Use a top quality conditioner. 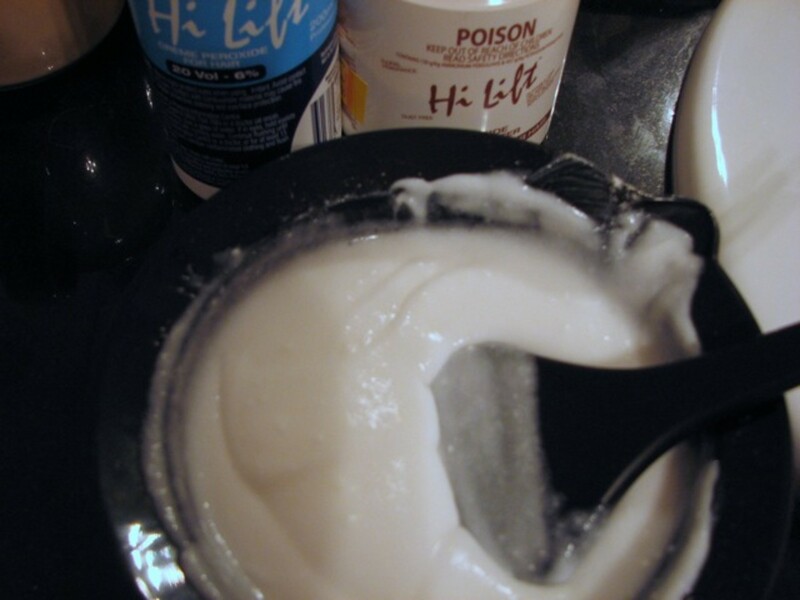 Use a good color-protecting hair masque treatment. Avoid using hot oil treatments - some can strip color. Use little if any hair styling product like hair spray, gel or wax. Is there any color you would not go? What is your favorite non-natural hair color? How many different colors have you been? DianeA - I haven't seen the Shielo brand of products around here (Germany) - perhaps they are not available world-wide. 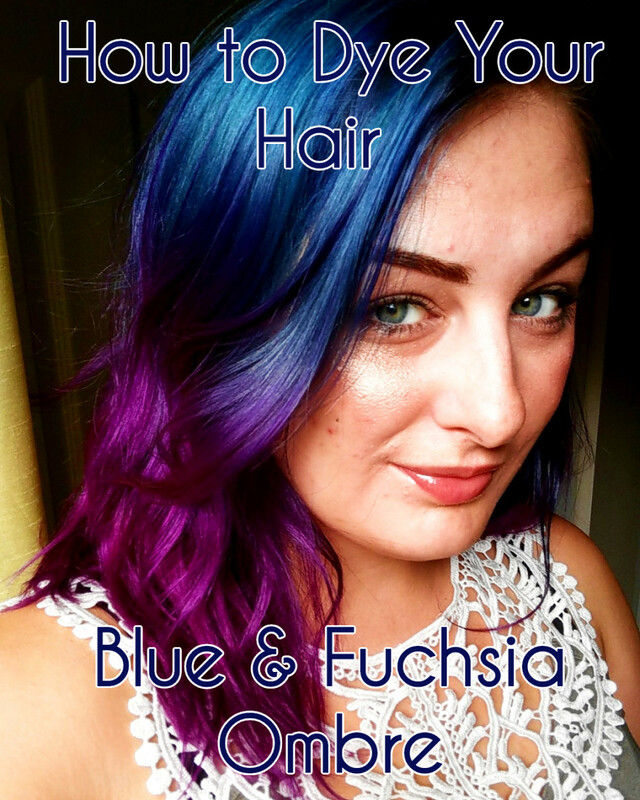 I'm glad you've found a great product to protect your colour and improve the condition of your hair! The Shielo Color Protect Shampoo was recommended on the Dr. Oz show of all things. I color my hair and now use the SHielo Color Protect to protect my hair between colorings. I color my hair a light golden brown and this shampoo prevents that dull look. It also makes hair nice and soft and shiny. I use it about 3x a week. Be sure to rinse thoroughly - it's a bit harder to rinse than regular shampoo but is worth the effort. I found the Loreal Elvive colour protect shampoo the best for *not* washing out too much of the blue (and not washing often). 4 times bleach?! Ouch! Luckily I have dark blonde hair, so not too many shades lighter - just needed to open my hair strand to get the colour in. Tilex? Sounds useful! I taught in Japan for nearly a year, but with the Fukushima craziness (I lived there), my health played up a bit too much, and had to leave early. Currently in Germany, trying to learn German, and teaching English - students aged 16-80 are easier and more fun to teach than young teens! I went a dark blue but it gets lighter every time I wash my hair, lol. The top where my bangs are seem to wash out the most for some reason. I have black hair, so I had to bleach my hair 4 times to get it dark blond. What a pain in the behind! Also, Tilex and a scrub brush helps get rid of the smurf murder evidence (blue stains). Also, I read the comments: Did you say you are going to school in Japan? If so, that's awesome. Laura - Yay - more blue hair! Murdered smurfs - did you go a lighter blue perhaps? The vaseline certainly helped, especially against getting blue inside the folds of my ears! I found that the blue under my nails stuck around for a couple of weeks, much longer than the skin of my neck -- dark coloured nail polish is the easiest to make them look good. Great hub. I too just died my hair blue. I did it in the bathtub. It looks like I murdered a Smurf in there! Great tip on the vaseline. I will use that the next time I do a touch up. And yes, I think I will paint my nails blue as well. I got all the blue off of my skin but not so much on the nails! Burgundy sounds nice, and a little more red. Thanks for dropping by! 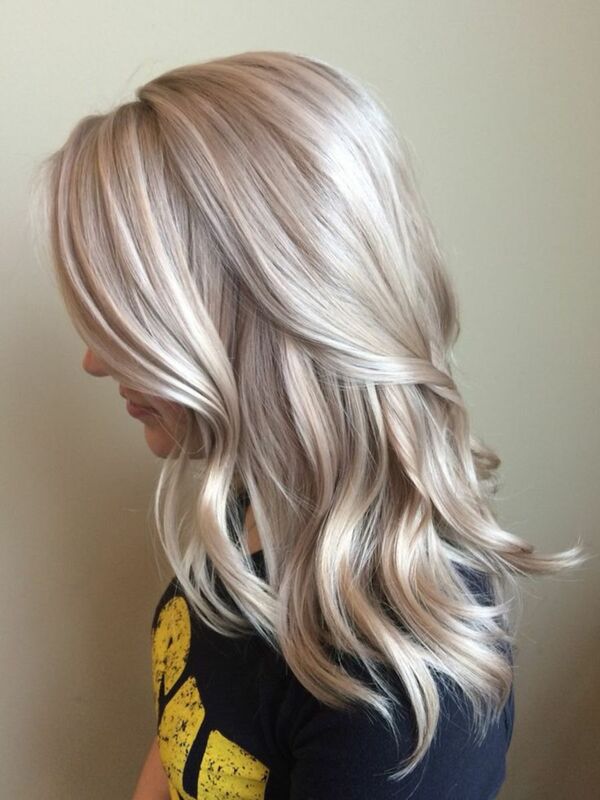 To make the colour penetrate really well, the hair shaft must be open, which is why you dye directly after bleaching - as it's done in hair salons. 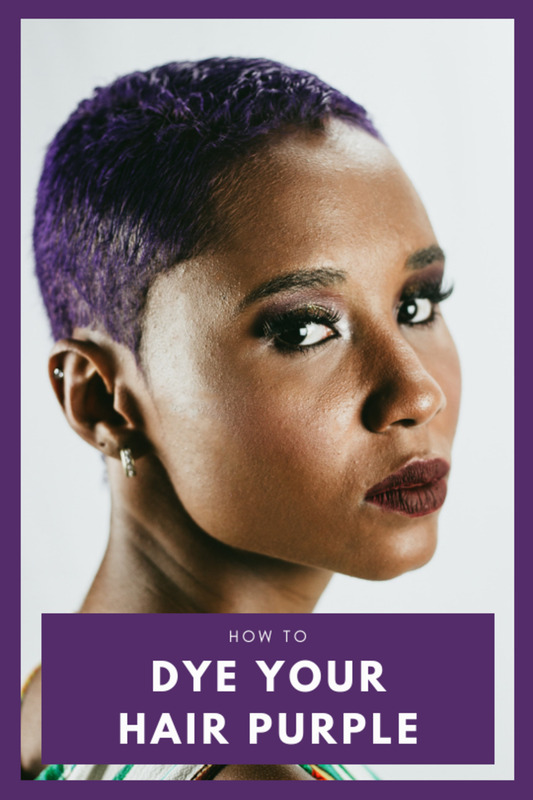 If you leave a few days after bleaching (which is not dying), the hair shaft will close, and the colour will not penetrate properly when you dye your hair. In my experience, Fudge dyes wash out in a couple of weeks, instead of nearly 3 months, if I don't dye immediately after bleaching. Doc - I don't actively cosplay, but I do love photographing cosplayers at anime festivals, and creating costumes for masquerade balls. Unsurprisingly, I'm drawn to watch anime with blue-haired characters! I like the purple shade in your photo. Do you do cosplay? That shade would be good for anime. Daisy - thanks! I was lucky to work at the uni, where crazy colours were accepted! Angela - thank you so much! 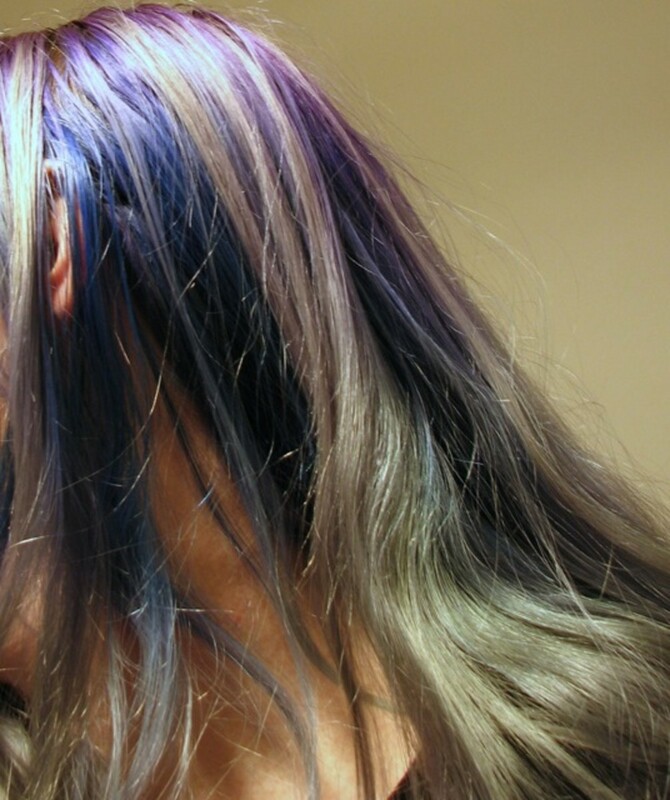 Is your daughter thinking of going blue/purple, or does she already have brilliantly colored hair? 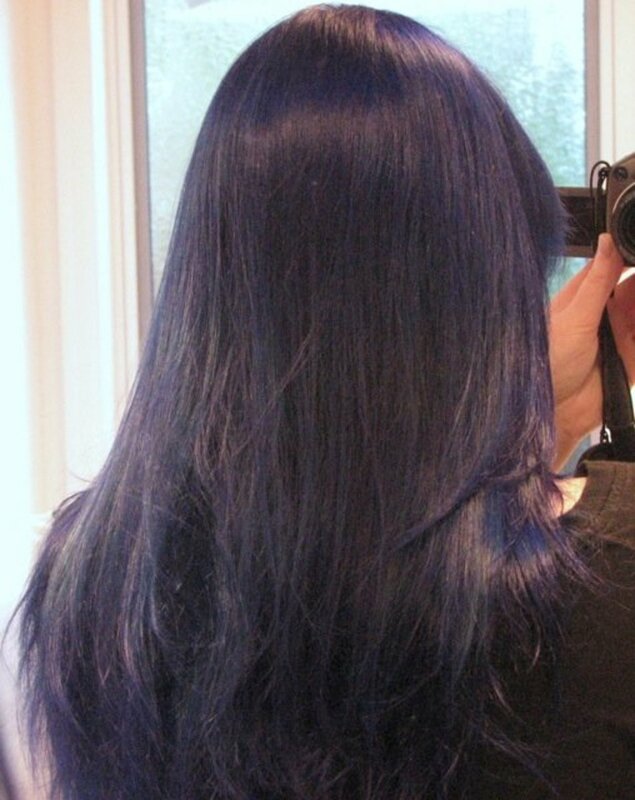 Marcy - It certainly made looking after my hair more intensive (and expensive), but I love the dark blue, so it's worth it. Thank you! Brainy - Purple fire! Beautiful! I'm also natural now, and missing my blue - blue hair at schools in Japan does not fly. Fudge and one other brand (not MP) were the only two to choose from, and only from very select stores when I first went blue. How well do the MP dyes cover hair without bleaching first? Ohhh I LOVE it! You look like a cartoon... and I mean that in the best of ways! Beautifully done and wonderful pics. Voted useful and awesome! I used to have purple hair back in high school, although I just overhyped my medium brown hair with Manic Panic. I loved it; it used to glow like purple fire in the sun. Boy, do I miss that hair! 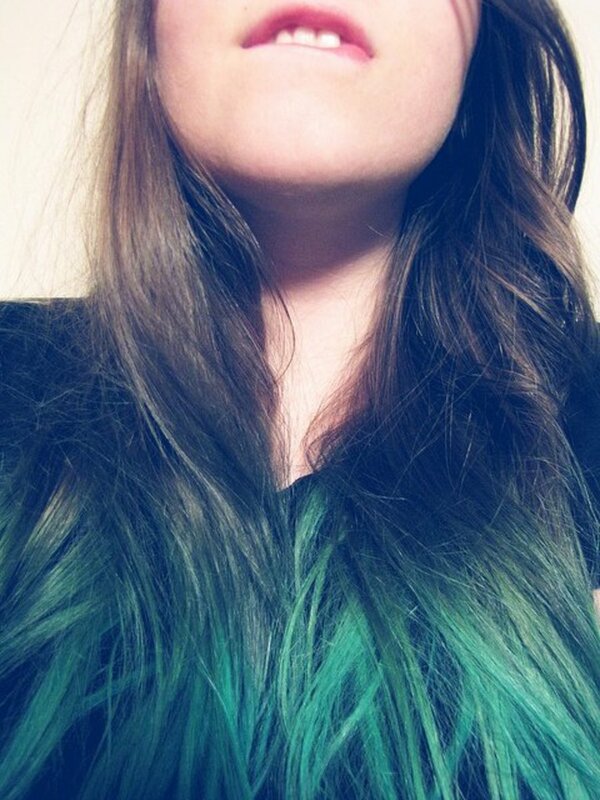 I've been so tempted to Go Blue or something with my hair - but I think I'm too chicken to do it longterm. However, as Daisy mentioned, you are a beautiful example of how elegant and interesting it can be! Great hub! Thanks for all publishing this Hub. What a fascinating, informative article! I've wondered how you got your hair to be that great purple color. I've thought about doing something this, but I don't think I'd have the nerve to do it.